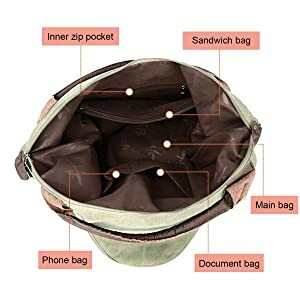 Large capacity, which includes the interior slot pocket, the cell phone pocket and the interior zipper pocket. Keep your backpack organized. High-quality metal hardware locks, exquisite and durable, which also make the handbag more personalized. 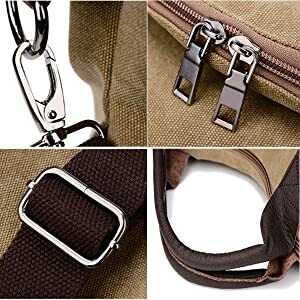 Double zipper, very convenient and practical design. The carrying area adopts special design which makes the bag more comfortable to carry. The canvas tote bag fabric is soft and wear-resisting so that you can have a long life for taking it. More important, the color also goes well with style. good quality bag, no smell, color as picture, lining is strong, pleases accessories (not крохких). 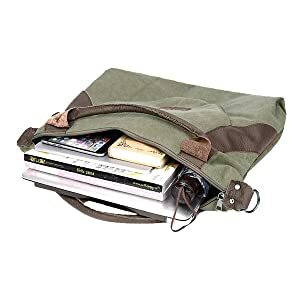 between zipper pocket 2 as the third bed, second hand with 2 and more and one rear outside-shut, cosmetic bag type front and housekeeper or. interesting design and convenient to use. purchase in very satisfied, recommend!!! good quality bag, no smell, color as picture, lining is strong, pleases accessories (not �ܧ������ܧڧ�). between zipper pocket 2 as the third bed, second hand with 2 and more and one rear outside-shut, cosmetic bag type front and housekeeper or. interesting design and convenient to use. purchase in very satisfied, recommend!!! сумка просто огромная. по фото и не понять, что она настолько большая. есть один внешний карман, один "карман" на складке спереди, внутри два маленьких кармана для мелочи, вкладки для мобильного и т.п. пришла очень быстро. спасибо! �����ާܧ� ������������ ���ԧ����ާߧѧ�. ���� �������� �� �ߧ� �����ߧ�����, ������ ���ߧ� �ߧѧ������ݧ��ܧ� �ҧ��ݧ����ѧ�. �֧����� ���էڧ� �ӧߧ֧��ߧڧ� �ܧѧ��ާѧ�, ���էڧ� "�ܧѧ��ާѧ�" �ߧ� ���ܧݧѧէܧ� �����֧��֧է�, �ӧߧ������� �էӧ� �ާѧݧ֧ߧ��ܧڧ� �ܧѧ��ާѧߧ� �էݧ� �ާ֧ݧ�����, �ӧܧݧѧէܧ� �էݧ� �ާ��ҧڧݧ��ߧ��ԧ� �� ��.��. �����ڧ��ݧ� �����֧ߧ� �ҧ���������. �����ѧ��ڧҧ�! very beautiful figment recomendables effective!! 100x100. the bag and well larger than i expected, very big!